Yes, I understand that doggie salons require cutesy names, just like cupcake store owners are required to wear tutus and government workers are required to take the entire month of December as vacation. And I can appreciate that. What I cannot abide is when a PERFECTLY GOOD play on words is RIGHT UNDERFOOT (so to speak) and the business owner falls just short of a spectacular naming opportunity. It is just such a waste (snicker). I mean, don't these salon owners have a duty (heh) to brainstorm until the perfect name emerges from the pile? DOG 'DO, for CHRISSAKES! 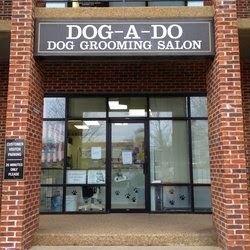 DOG 'DO is the perfect name! It was right there! Dog-a-Do isn't even an acceptable #2 choice (cough, cough). They better not come crying to me when it all hits the fan. P.S. Many thanks to The Poop Thesaurus -- what a fantastic research tool.